Is online messaging the next big thing for student recruitment? Have you already mastered Google keywords and hammered out a great social media strategy? If so, fantastic! But, as you would probably guess, there is more to be done in the quickly evolving digital marketplace. Important new mass communication channels are taking shape and recruiters are starting to take notice. Online messaging has emerged as the new social network, and the sheer size of the rapidly expanding audiences on major chat platforms – including market leaders such as WhatsApp, Facebook Messenger, and China’s WeChat – is hard to overlook. Business Insider reports that the global user base for the seven largest chat apps grew by 148% (or about 900 million users) between March 2013 and March 2014 alone. Where has this massive user base come from, and how did it arrive so quickly? Part of the story here is the mainstream global adoption of mobile devices. Interestingly though, as much as mobile channels have expanded in recent years, online messaging has grown more quickly still. A recent report from the Tow Center for Digital Journalism offers a compact history: “As smartphones began to proliferate, messaging apps were an increasingly accessible solution to a simple problem: SMS [that is, conventional mobile text messaging] is expensive in most countries, so why not text or call much more cheaply, or for free, via the mobile web? WhatsApp and Facebook Messenger – both owned by tech giant Facebook – are the leading global chat apps. WhatsApp has more registered users globally but Global Web Index reports that Facebook Messenger is more heavily used (at least outside of China) with four in ten Internet users using Messenger each month as opposed to the one in three that use WhatsApp. 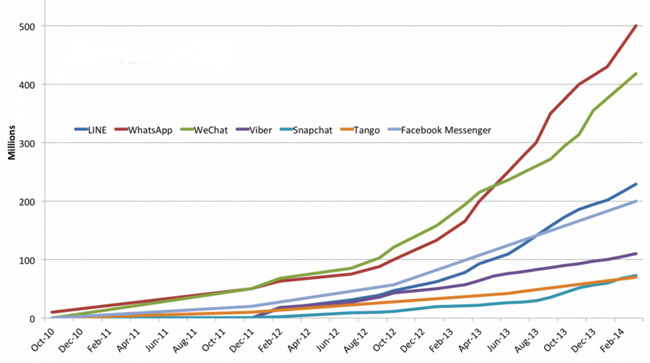 Global monthly active users for top messaging apps through February 2014. Source: Business Insider. Readers will note the “outside of China” qualification in the text above. Within China, WeChat is by far the dominant platform. It counts an estimated six of ten Chinese Internet users in it user base and effectively functions as a mobile web portal in this key market. Also of note related to the chart above, WhatsApp’s monthly active user base is estimated to have roughly doubled again in the two years between February 2014 and February 2016. However, WhatsApp continues to build its user base very quickly indeed and Statista has the platform’s global base of monthly active users at one billion as of February 2016. Further, WhatsApp is the top message app in 16 of the 34 countries tracked by Global Web Index, including India, South Africa, Malaysia, Spain, and Mexico. And its users are very heavily engaged with six of ten “WhatsAppers” using the service several times per day. All of which underscores ease of use as one of the signature elements of chat apps. Messages and content are delivered freely within the app with no fees or limits from carriers. And communication is frictionless, fast, and accomplished with nothing more than a few taps on the screen. The size of the audiences now using online messaging apps, and the amount of time that users spent on such services, has led investors to value them highly and has drawn considerable attention from media and marketers as well. As in the early days of social media, however, the strategies and practices for reaching target audiences via online messaging are still taking shape. Part of the challenge is the fragmentation of the space. There are the globally dominant apps, such as WhatsApp or Messenger, but that global heft breaks down on a market-by-market basis where niche or national players may also have a leading role. New apps are coming into the market all of the time and across the field each has its unique features and capabilities. They support various combinations of text, videos, and images. Others more closely resemble social networks by allowing users to “like” or follow other users. And still others have advanced geo-targeting capabilities that allow broadcast messages to users within a certain radius. As with the early periods of search or social media marketing, the key for many recruiters will simply be to make a start: to experiment, to learn, to listen, and to gain experience on these important, emerging platforms over time. There are some early examples of paid advertising popping up on some of the chat platforms – think of this as being comparable to advertising on free email or search services. As with social channels, online messaging can also play a role in fielding student queries, providing support, or identifying and encouraging alumni or other brand ambassadors. Brands are also increasingly running targeted campaigns on online messaging services. 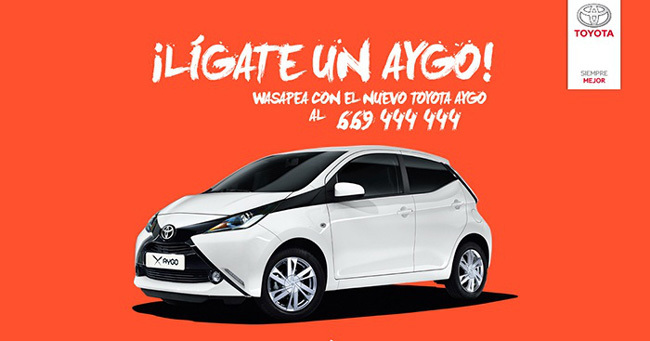 There are a number of contemporary examples of this, but TechCrunch highlights an interesting one from Toyota in support of a new product release in Spain (note the social media integration as a way to drive opt-ins and user engagement on the messaging platform). The Toyota example, as with so many others, looks at how you can introduce a targeted campaign within a major messaging service. Some marketers, however, are stepping around the constraints of the major chat apps (notably WhatsApp with its 256-user limit on broadcast lists) by creating their own proprietary chat platforms. We are beginning to see the first of these in international education, a notable example of which is the Admission Table app developed for Android devices and focused on the burgeoning Indian market. Counselling and advisory services are provided within the app, along with some additional telephone support at later stages of the process, and Admission Table and its client universities have ready access to the growing audience of students around the service. As these early examples suggests, online messaging services offer a chance to connect with a highly engaged audience in new and innovative ways. The trick for many marketers will now be to figure out how to capitalise on that opportunity and to work effectively in this new, mobile, on-the-fly context. This entry was posted in Africa, Asia, Australia/Oceania, Europe, Marketing, Middle East, Most Popular, North America, Regions, South & Central America and tagged student enrolment, prep schools with international students, marketing study abroad to parents, backpackers marketing, universities with international students. Really informative article. Thank you very much.